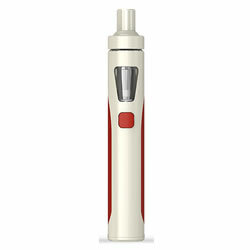 Joyetech eGo AIO - WHITE-RED kit buy from NUCIG UK. Tobacco GREEN Lable 70VG/30PG 12MG Tobacco GREEN Lable 70VG/30PG NICOTINE FREE Menthol GREEN Lable 70VG/30PG 18MG Menthol GREEN Lable 70VG/30PG 12MG Menthol GREEN Lable 70VG/30PG 6MG Menthol GREEN Lable 70VG/30PG NICOTINE FREE No Thanks. The Joyetech eGo AIO (All In One ) Kit is a compact starter kit perfect for beginners looking for a lightweight setup. This sleek and simple bit of kit has a battery + tank combo - perfect for beginners looking to start vaping without being overwhelmed thanks to its one-button design and built-in battery/tank combo. 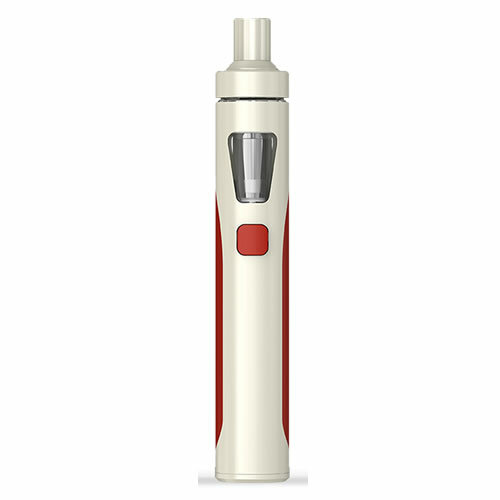 This Joyetech eGo AIO also comes with a micro USB charger and a total of 2 mouth drips. The battery has 15000mAh capacity which powers out with the 0.6 ohm klapton coil. The coil also uses Japanese organic cotton wick material for a fuller flavour vape and satisfying cloud production. A 2ml capacity, adjustable airflow and which uses replaceable heating coil heads. Compact and ideal for the new starter that makes a fair amount of dense vaping smoke. I am not one for the big chimney smoke blasters that seem all the rage at the moment. I just want a kit which is easy to carry, use and effective. This kit ticks all of my boxes.